Keep the change and see the change within yourself with Trudy James' thought-provoking penny necklace. Keep the change and see the change within yourself with Trudy James's thought-provoking penny necklace. Inside a sterling silver disc is a miniature penny that bears Honest Abe's well-known likeness on the front and a hidden question mark on the back. 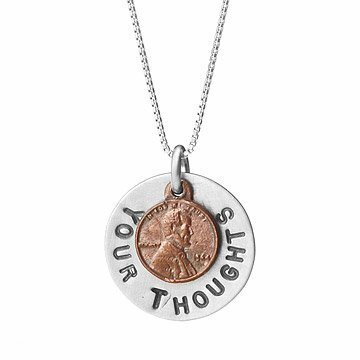 The silver component is hand-stamped with the phrase "your thoughts," making her pensive pendant ideal for deep thinkers who could use a little luck finding inspiration. Handmade in San Diego, California. Keep away from chemicals, store in airtight container, polish silver with abrasive pad provided if needed. Not at all like pictured. "Mini-penny" is totally unrecognizable.."Penny" hangs crooked within the larger disc. I seriously wanted to cry when I opened it...but did my best to appreciate the gift that I had told my husband that I'd wanted. This artist / designer should seriously be ashamed to sell this quality (NOTHING like advertised)-- VERY deceptive..poor quality...and just a flat out LIE as to what is pictured and what you get. Wow... Caveat Emptor much, lady?